Our students surely sense this dreaminess. Those who have been attracted to Goldsmith’s experimental year-long seminar on writing in/through/but-not-“about” contemporary art are among the finest and most intellectually daring and capacious and powerful undergraduate students we have at Penn. And, to judge anecdotally from what visitors from other great universities have said after spending time with them, they might well be among the most intrepid in the U.S. It’s a claim that can’t easily be tested, but it does seem a fair and apt one. The seminar is the result of an ongoing collaboration the Creative Writing Program in the Center for Programs in Contemporary Writing (CPCW) and the Philadelphia Museum of Art (PMA). 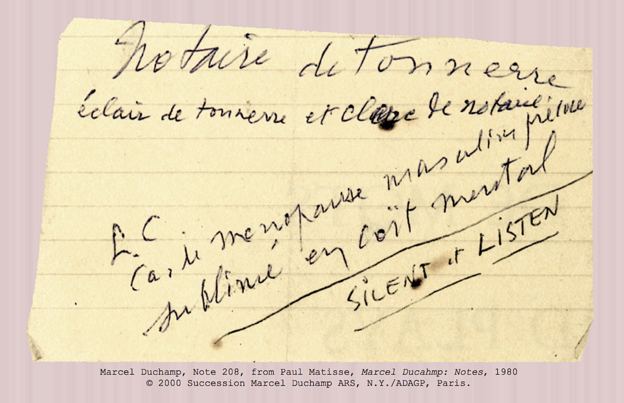 It is a beautiful convergence of the two entities: right there where Marcel Duchamp’s infrathin space-between-spaces and the students’ own experiments with language meet. Where “The dictatorship of grammar” (#100) is only there to be overthrown. Where “The vibrations from sound, audible yet invisible” (#243) are nonetheless seen. Where the space “Between saying and meaning” (#385) is also known as the classroom. Where one is by design never forced to choose “Between passion and purpose” (#993). As Goldsmith has enjoyed saying to anyone within earshot, the poetry world is more than a half-century behind the visual art world; experiments in painting, sculpture and conceptual art have been doing things that most poets and poetics people have heretofore felt impossible or unnecessary. The term “behind” suggests a competition, but of course it’s not that. It’s not a course (as it were) with a finish line or single endpoint. It’s a means, a movement defying conventional academic evaluation, a way toward fresh conception through educational defamiliarization. The success of the project comes from putting the two worlds aesthetically — and pedagogically — together. Thus will emerge, we expect, a new generation of artists and arts-minded citizens who are actively uninterested in distinctions between the arts; they know it’s all one project. You hold in your hands a wonderful instance of that resistance to distinction. And, too, an expression of young people who have been encouraged to think innovatively in that odd interstice created by this seminar’s transformation of Art History or English (or Computer Science) majors into “diehard Duchampians.” For some or perhaps most this transformation followed the quasi-accident of stray enrollment in an interesting-seeming seminar whose deep, intense encounters — such as spending three hours with Thierry de Duve looking at The Large Glass — were utterly unanticipated. What’s not accidental is the support we receive in order to pull off this venture. We wish to acknowledge Mingo Reynolds of CPCW, and Julia Bloch, Director of the Creative Writing Program, for their support of Kenny and his students; Dirk Wittenborn and the Cape Branch Foundation for their ongoing grant funding for this innovative Penn project; and Matthew Affron of the PMA for his tolerance of our sometimes whimsical approach and for his shared vision.